3 Weight Loss Facts You Need to Know for Effective Fat Burning: Lose Body Fat Faster! Ignoring these basic weight loss facts makes it difficult to burn fat naturally; use them to avoid the frustration of not being able to lose body fat as fast as you’d like. The basics of how we gain and lose body fat should be elementary school curriculum. Not knowing these basics causes you disappointment, self-blame and confusion. In contrast, learning about these basic weight loss facts saves you tons of time and frustration because you can stop the endless game of hit-and-miss with fad diets and nonsense tricks. It makes you completely confused and frustrated, doesn’t it? You might have even given up trying to make a sense of it all. But learning how burn fat shouldn’t require an advanced degree! Once you understand what makes you gain extra weight, how to burn fat naturally and how to set realistic weight loss goals, half of the “job” of effective fat burning fat is actually done. The other half is actually implementing these, of course. So let’s get down to finding out these basic weight loss facts. To burn fat naturally, you have to understand this. When your caloric intake from food is larger than your caloric output, your body stores the extra calories for later use – as fat (fat is the easiest to convert from calories and back into calories as needed). For all the energy you need, your body burns calories through a highly complex biochemical process: the metabolism. When you eat more calories than your metabolism burns for your body’s immediate needs, you store this surplus as fat for later use. Conversely, when you need to spend more calories than you’ve just eaten, your metabolism burns previously stored fat to provide these extra calories – provided you don’t have any of the health issues that could make you unable to lose weight. You should know that the metabolic rate can be adjusted to maximize its function so it actually helps you in burning fat for weight loss. …at a rate higher than about 2 pounds per week (0.9 kg). It’s not possible physiologically. Although under specific circumstances you could lose more than 2 pounds of body weight per week, that includes water, muscle or both – not only body fat. And water is shortly regained as soon as you re-hydrate your body. As for muscle, you don’t want to reduce your lean muscle mass; this would make you gain even more weight in the long run. Because your muscle mass is your metabolic furnace. The more muscle mass you have in your body, the more calories you burn during exercise, at rest, and even while you sleep. That’s why not only maintaining, but actually increasing your muscle mass is vital for effective fat burning. Are you asking, how to increase your muscle mass? Well, aerobics alone won’t do it. You will need to add about 20 minutes of strength-training three times per week. …takes you a long way to your ultimate weight loss goal. Because by following a plan consistently, you can actually achieve these realistic goals. Consistency is the key here. For example, a realistic goal would be to lose 2lbs of fat/week. The equivalent of one pound of fat is 3,500 calories. Do the math… in order to burn 2lbs of fat/week, you’d have to create a weekly deficit of 7,000 calories, which means a daily deficit of 1,000 calories. Based on an average intake of 2,500 calories/day, you can achieve half of this deficit – i.e., 500 calories – by reducing what you normally eat by 1/5, or 20%. So this is one of the most important weight loss facts: you do NOT need to count calories to burn fat naturally. Simply cut one fifth of whatever you’re currently eating AND include 15-45 min of aerobic activity daily – in addition to your strength training workouts, which will increase your lean muscle mass. Depending on how much weight you want to lose, maintain this deficit of approx 1,000 calories daily and lose up to 8 lbs in a month, up to 24 lbs in 3 months and up to 48 lbs of body fat in 6 months. Of course, in the long run there are more things to consider; these are just the basics of effective fat burning. 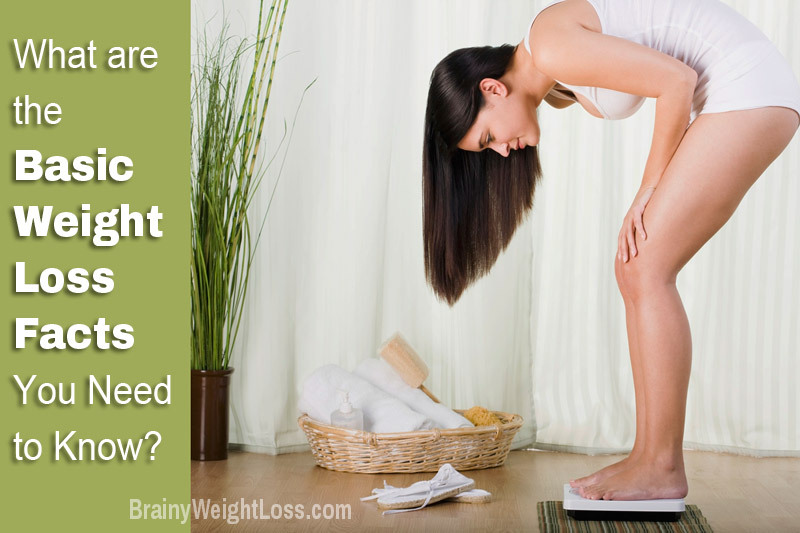 What Other Weight Loss Facts You Need to Consider?